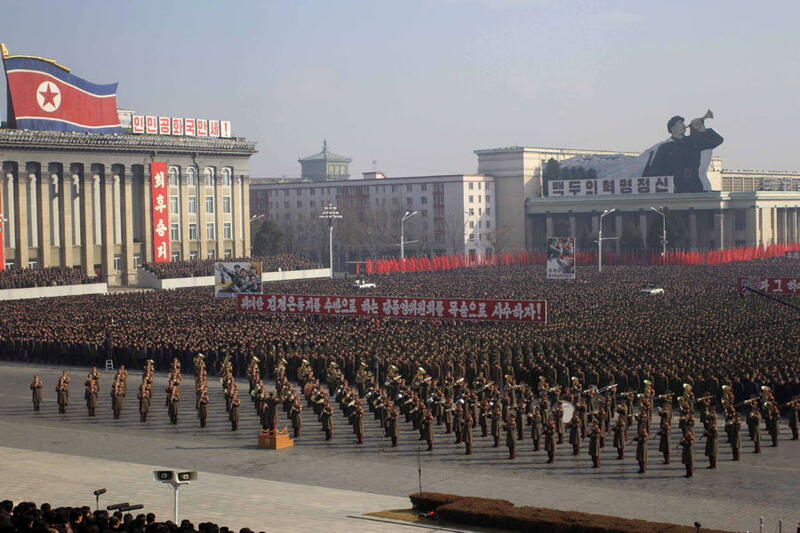 North Korean propaganda: outlandish glimpses at what one of the most dangerous countries on earth thinks about us--and claims to have in store for us. 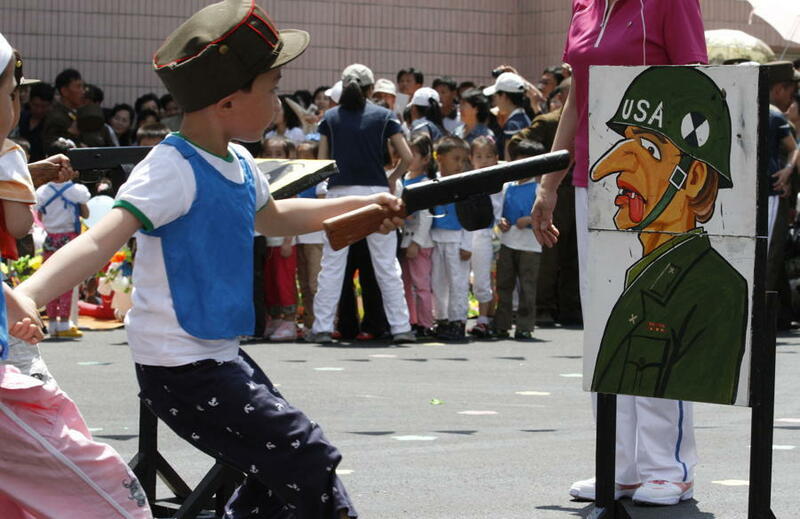 A North Korean kindergartener takes part in a popular playground game at Kaeson Kindergarten in Pyongyang. On March 2, 2013, a short documentary surfaced on YouTube. The clip purported to be a recently uncovered North Korean propaganda video revealing the squalor in which Americans live. Amid a backdrop of rampant homelessness and gun violence, Americans ate birds (with which they made soup) and snow (with which they made coffee) in order to survive. They lived in shoddy tents, bolstered by supplies from North Korea. By March 10, it had hit LiveLeak and the wheels were in motion. Two days later, Yahoo News posted it, after close of business on the East Coast. The following morning, March 13, the frenzy began. A rash of sites reposted the video, many within an hour of each other around noon. By the end of the day, the video had landed on, among many others, Slate, Wired, The Week, The Telegraph, and The Washington Post. Some used words like “alleged,” some didn’t, and hardly anybody really questioned it. Sometime that day, The Huffington Post realized the video was a fake. The visuals were from an authentic North Korean propaganda film (“Capitalist Society Growing Darker”) but the crucial narration was the tongue-in-cheek work of a British travel writer. The Huffington Post’s story went live and then, from around the web, retractions rolled in. Soon, many noticed that the clues were there all along: the original YouTube video was filed under “Comedy” and “Entertainment” with a title that began “North Korea Comedy Show.” But even if it weren’t for the fact that the visuals were authentic and that the fake narration was more or less true to the spirit of the original’s narration, you couldn’t really blame anyone for thinking the video was real. Myers’ book is largely a study of North Korea’s propaganda, an apt entry point into understanding an isolationist country whose identity is almost entirely wrapped up in both what it tells itself about itself and what it tells itself about the outside world. 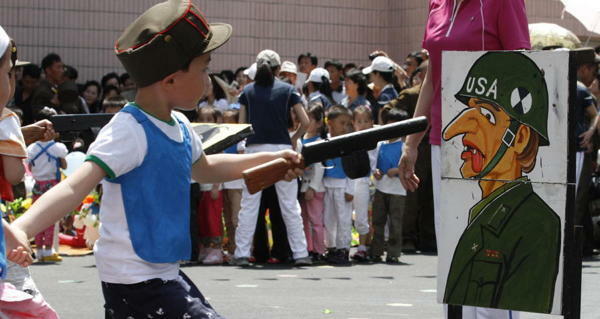 With exit from and entry into the country very tightly restricted–both in terms of people moving across borders and telecommunications moving through signals and airwaves–North Korea is something of a hall of mirrors. With virtually no outside information coming in, citizens are to believe that the country is simply the way the leadership says it is, as is the rest of the world–and particularly the U.S. So, sure, they “hate” us. Perhaps more than any other country on earth. And, sure, like the video–the original, authentic one, mind you–says, they think Western capitalism is doomed. But what exactly do they think of us; what exactly does their propaganda teach their citizens about us?